University students in Quebec have been protesting. They have been told that the government is going to raise their tuition fees. In this case, “tuition fees” are the fees people pay to attend university. Traditionally, Quebec has some of the lowest tuition fees in Canada. Only students in two provinces: Newfound and Labrador and Manitoba, pay less to attend university. However, the increase will be the largest in the province’s history. The government intends to raise tuition by $1,625 by 2017. Students will pay $325 more each year for the next five years. Student groups say the increase doesn’t go towards improving the quality of the teaching, and the hikes will force some students who can’t pay the extra money to drop out of school or take a second job. They worry that students who come from low-income families won’t be able to afford higher education. 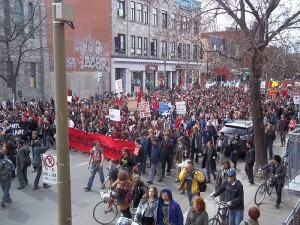 As a result, students have been demonstrating on campuses in Quebec. The protests started about 14 weeks ago. This week, some protests became violent. In Sainte-Therese, Que. a group of students, teachers and parents was protesting at College Lionel-Groulx. Protesters were told to leave, but when they didn’t, police were called in. They used tear gas to get the crowd to disperse. There have been other protests in the province. In Montreal, the Jacques Cartier bridge was blocked; and about 200 protesters tried to break in to a meeting at the Intercontinental Hotel in downtown Montreal. And on Wednesday (yesterday), more than 100 protesters shut down classes at the University of Quebec in Montreal by taking over the school’s downtown campus. Many of the protesters wear a red square as a symbol of their protests. Some other students, who are against the protests and who aren’t as worried about the tuition increases, are wearing green squares in opposition to the protesters. About a third of university and college students are boycotting their classes in protest of the tuition increases. Some people say the protests are becoming symbolic, and are about more than just the tuition fees; they say the protests are against “authority” in general and have to do with general unrest. Powered by Mario2903 and premiumbloggertemplates.com. Powered by Blogger. Copyright © 2012 NewsNet™ | Bring you the latest world-wide news | All rights reserved.